The corruption that never makes headline!!! The bridge constructed to connect Manjalpur and Kalali areas, was inaugurated by Chief Minister Anandiben Patel on July 12. A Mahesana-based private firm had constructed the bridge and approach road with a cost of Rs 13 crore. Hope no life was lost and no one was hurt. 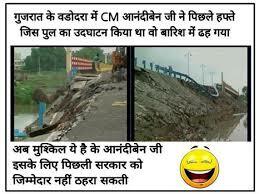 Now, would the Gujarat government blame Congress, Terrorists or Pakistan for this shoddy construction?.